For the past 13 years, traffic-related incidents have been the highest cause of law enforcement fatalities. 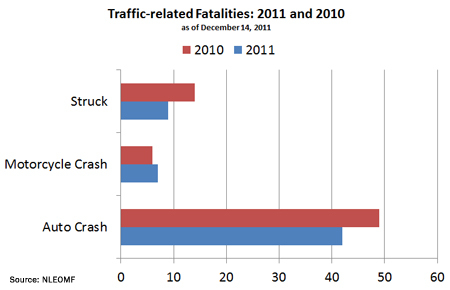 As of December 14, 2011, traffic-related law enforcement fatalities are down 16% from the same time in 2010. Seventy law enforcement officers died in traffic-related incidents in 2010, with 49 killed in automobile crashes, 14 struck and killed, six officers killed in motorcycle crashes and one officer killed in a bicycle crash. So far in 2011, there have been 42 officers have been killed in automobile crashes, nine officers struck and killed, seven killed in motorcycle crashes and two killed when a train struck their vehicle. The National Law Enforcement Officers Memorial Fund will issue its annual Preliminary Law Enforcement Fatality Research Bulletin on December 28, 2011, which will contain more detailed information about traffic-related fatalities and all law enforcement fatalities. with the Lifetime Achievement Award in May 2011. Today, the Memorial Fund mourns the loss of its close friend and Board Member, Robert Gordon. Robert (Bob) Gordon was a Founding Board Member of the National Law Enforcement Officers Memorial Fund. During his 27 years with the organization, he served as an original member of the Names and Officer of the Month Committees. Mr. Gordon served the law enforcement community with distinction for nearly 60 years, starting with his appointment to the Freeport (NY) Police Department in 1952. He was a longtime police labor union leader and lobbyist and the Secretary Treasurer of the United Federation of Police. Earlier this year, Memorial Fund Chairman & CEO, Craig W. Floyd presented Mr. Gordon with a Lifetime Achievement Award, for his leadership and dedication to the National Law Enforcement Officers Memorial Fund. Mr. Gordon will be greatly missed; condolences to his family.